This all happened a few years ago – 2005 to be exact, when through a happy turn of events Ben was able to secure tickets for all four of us to go to the “Roadshow”. The bad news was that the closest event to us that year was in Providence, Rhode Island, about a seven hour drive away. Even so, we weren’t about to pass up the chance to see our favorite show in person. Since we knew the odds of getting on TV were less than one percent, we pretty much abandoned hope of making it to the little screen. We figured the best thing to do was to use this experience as an opportunity to find out more about some of the stuff we were having trouble finding values for on our own. We wanted to hear what the experts had to say. 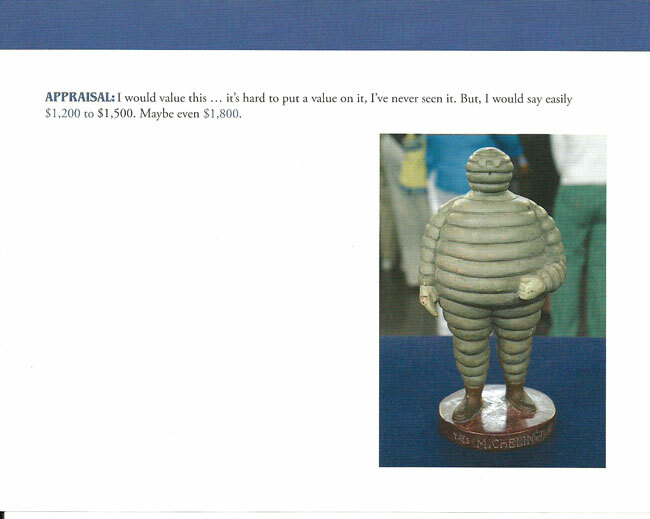 One of the items we determined to be “Roadshow” worthy was our little Michelin statue. Purchased by Carol in 1987 for the grand sum of seven dollars, she found it at the yard sale of an auctioneer. I received it as a birthday present that year. Standing just fourteen and a half inches tall, this little guy doesn’t look much like the cuter powdered doughnut version of Bibendum (yes, he has a name) that we see in commercials today. Bibendum’s origins go all the way back to 1898 in France. The Quaker Oats guy and Aunt Jemima have been around longer but they have human forms, they’re not made out of, well, tires after all, nor do they smoke, drink and dance with women in their early ads either! Leave it to the French to have an advertising icon with a true joie de vie! Indeed, Bibendum, by the way, is Latin for “drink to be done”! He was sort of the bad boy of early advertising icons! Like all bad boys, however, that made him kind of cool. We arrived at the Rhode Island Convention Center at about 8:30 that June morning and were greeted at the door by volunteers wearing light blue “Antiques Roadshow” polo shirts who directed us to go up the stairs and to the end of the ever growing line. The line moved quickly, however and soon our tickets were checked and we each showed our items to a couple of ladies who determined which appraisers we would each see. The Michelin Man earned me a ticket to the “collectibles” line which was understandably among the longest there. In about only fifteen minutes or so though, I found myself face to face with Gary Sohmers (the guy with the white ponytail) who looked at my little tire guy and determined that Noel Barrett (at the adjacent toy table) would know more about it than he. Suddenly there was Noel Barrett holding my little French advertising icon in his hands. They seemed to be sizing each other up! The seasoned dealer, auctioneer and appraiser looking down and Bibendum looking up. There obviously was a bond forming. Noel Barrett (the other guy with a ponytail by the way) then motioned that I come over to the toy table and have a seat behind the appraisers desk while he contacted his producer. Holy cow, he wants to put us (mainly Bibendum) on TV! I motioned for the rest of the family to join me and nobody seemed to mind all of us sitting there watching all the activity before us. We also met a nice lady from Maine with her doll furniture, who was also waiting to talk with the producer. She would end up on TV also. Eventually the producer (Marsha Bemko) came over and talked first to the nice lady from Maine and then to me. After a few question I was asked if I would like to be on TV and escorted to the “green room”. The green room wasn’t actually green but was a separate area partitioned off by curtains. There were several long tables by which to sit and wait your turn. In each corner was a monitor showing the live raw feed of what was being taped. There were also two make-up people. The appraisers would go to one before their taping and the rest of us went to the other. While in there we met Mark Wahlberg, who was on his first day on the job as the new host. He, Noel Barrett, and everyone else was very nice to us. My turn finally came and out I went holding the Michelin Man. I was directed to one of the three tables in the center of the room set up for taping. My microphone was hooked up and soon Noel Barrett joined me and off we went. My three minutes of fame had begun! I can’t say that I wasn’t at least a little nervous but I was really enjoying drinking in the experience (that would be bibendum in Latin) and I realized that I was actually living something that I had dreamed about. One of the advantages that comes with age is that you worry less about what other people may think – even if there’s several million of them. I had a great time. I would have to wait eleven months to see if I made the cut that day. As with most TV shows, the “Roadshow” tapes more material than it uses, so the possibility of ending up on the cutting room floor still existed. Finally in May, 2006 in hour 2 from Providence, Rhode Island, there I was. I was on TV. I had made the cut. So far my episode seems to run about every two years. The last time I saw it on TV was last summer (2012). It became the gift that kept on giving! 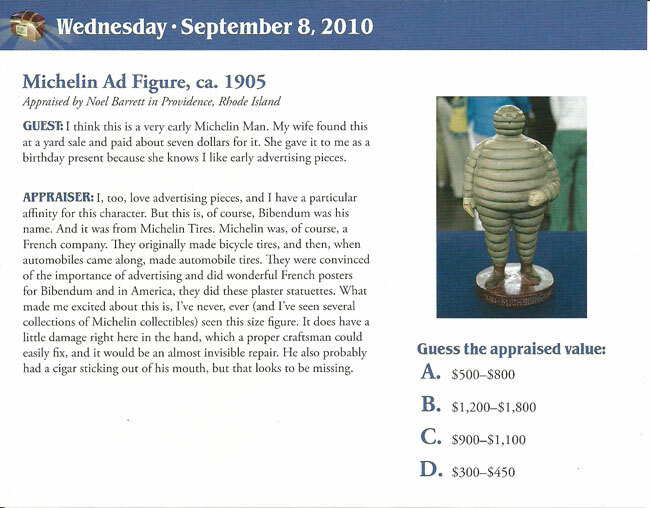 As far as the appraisal is concerned, below is the page from the 2010 “Antiques Roadshow” calendar which tells the story. You can also view the appraisal on the “Antiques Roadshow” website in the archive section – just type in “Michelin”. Watch the clip and read the transcript here at the Antiques Roadshow website. 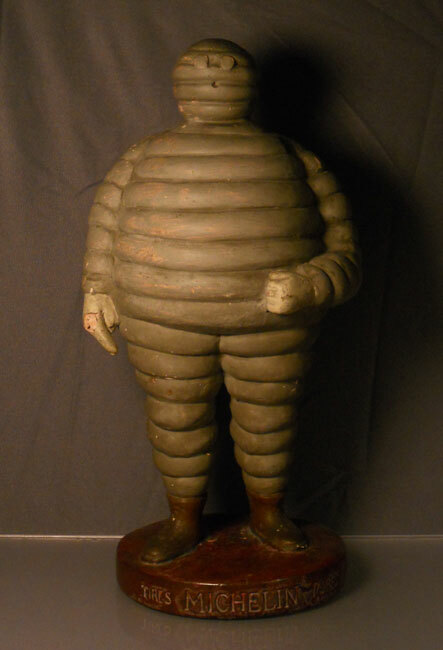 By the way, the Michelin Man is still with us. He wasn’t so valuable that we felt we had to sell him. Valued at $1200 to $1800 he went right back to his familiar spot in our family room, but now he has a great story behind him. He was, after all, on the “Antiques Roadshow”. As for me, it didn’t exactly make me rich or famous. Many people I knew told me that they saw me on TV but nobody ever asked for my autograph. The whole experience, however, has only made me fonder of the “Roadshow”. May it keep going for many years to come. This entry was posted in 1800's, 1900's, 1910's, 1920's, Advertising, Foreign, Historical, Jim, Weird. Bookmark the permalink. I still hope that one day I will be able to purchase the great piece from you, contact me anytime.